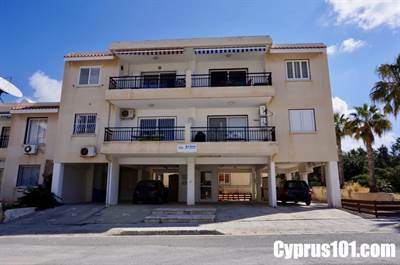 This well presented top floor, 2 bedroom apartment in Chloraka is located within easy walking distance to the popular village which has a wide range of local amenities. Paphos, the coast road and local beaches are a few minute’s drive away. The apartment features an open plan living room including comfortable lounge with corner wood burner fire, dining area and end kitchen with breakfast bar. Sliding patio windows in the lounge provide easy access to a good size balcony with sun awning above where you can enjoy the lovely sea views. A second balcony accessed directly off the kitchen offers views of the adjacent green area and distant mountains. A hallway off the living room leads to two spacious double bedrooms with fitted wardrobes and a family bathroom. The property also benefits from an allocated covered parking space, plus secure foyer access. Communal facilities include a well maintained private pool area with toilet and shower facilities. The property is perfect as a holiday home and/or rental investment, comes fully furnished and has full title deeds.